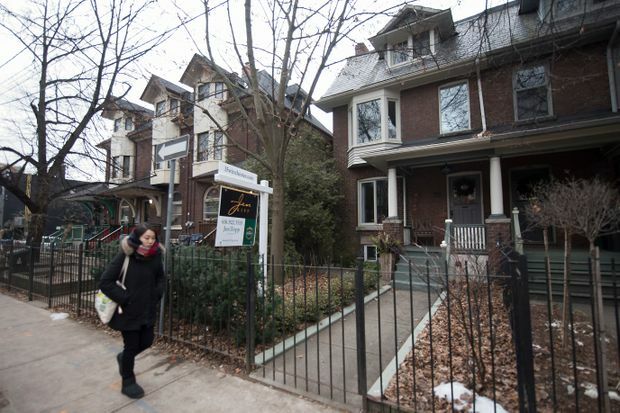 A pedestrian passes a home for sale in Toronto's Cabbagetown neighbourhood on Jan. 15, 2019. Toronto council voted to approve the city’s 2019 budgets and increase residential property taxes by 2.55 per cent this year, with Mayor John Tory and his allies beating back attempts from councillors on the left to raise the rate higher. Thursday’s vote fulfills an election pledge by Mr. Tory not to raise this tax rate past the rate of inflation. But critics said that years of this approach have left a city increasingly unable to fund its needs. The actual rise in tax bills will be higher than the vote suggests, a total of 3.58 per cent once a city-building fund is added and other adjustments are made. According to city staff, the new tax rate would cost the owner of the average property $3,020 – a $104 increase over 2018. Other costs are going up as well, with the water fee rising 3 per cent, the solid-waste rate climbing 2.2 per cent and transit fares going up by 10 cents. Once at the floor of council, though, none of the proposed tax hikes added more than 2 per cent to Mr. Tory’s preferred 2.55-per-cent increase. They were all voted down, including a pair by Councillor Kristyn Wong-Tam that called for 0.002-per-cent and 0.006-per-cent increases, enough money to fund, respectively, a program helping low-income people facing eviction and an aquatic program in a disadvantaged neighbourhood. Mr. Tory did not speak to these motions but Councillor Jim Karygiannis later called it “a little petty” to push for new spending on the floor of council. “This is the [sort of] thing you need to move forward at the budget committee, and with that process,” he told reporters. Later in the day, council approved the city’s $13.47-billion operating budget and $40.67-billion capital budget. The city is not permitted by law to borrow to cover operations and this budget makes a number of assumptions to paper over shortfalls. It requires Ottawa to meet the city’s request for $45-million in refugee support and the Toronto Transit Commission to find $24-million in unspecified “efficiencies” over the year. Another $10-million is to be drawn from the city’s non-union staff. Mr. Tory pledged that the TTC money would not be found at the expense of services and said that “every assurance that I’ve received” leads him to be optimistic about securing the federal money. The budgets also contain other potential land mines. The state of good repair capital backlog – the cost of keeping city infrastructure in sound working conditions – is projected to grow from $6.02-billion in 2018 to $9.30-billion in 2028. The picture looks worse when the rehabilitation of the Gardiner Expressway is taken out. Absent that big-ticket item, the backlog is expected to grow from $3.82-billion to $9.24-billion over that same time-period. And on the operating side, staff acknowledged that city finances cannot rely indefinitely on a frothy real estate market. The land-transfer tax went down by $77-million, from 2017 to 2018, the first reduction in recent memory after years of sustained growth. For 2019, staff assumed that revenue from this tax will not rise, and that it will take in the same $727-million projected for 2018. The budget debate came after the size of the property-tax increase was locked in. The choice to handle the latter first was made by the mayor, emulating a tactic that was also used by his predecessor, Rob Ford. The effect was that, since the amount of incoming revenues were fixed by the tax vote, any additional demands for funding increases would have had to be matched by reductions elsewhere in the budget. Councillor Gord Perks, who advocated in vain for a property tax increase 2 percentage points higher than the amount decided on by council, argued that the most vulnerable benefit the least by keeping this rate down.